We’re almost out of the South. Thousands of Wigs! Hairpieces, Wigs! Trailer hitched to pickup tilted off the highway. Welcome to Johnston County. Olde South billboard, decaying. It’s metaphor, you said, and, I want to see a civil war battlefield. How’s your coffee? It’s tea. Vermont will have windy roads. With cliffs. worry about their fear of bridges. Read poetry: Maureen’s, Dean's, Mr. Breadloaf. We’re near the home of Smithfield Hams. A poem with repetition: where are my wigs? Bentonsville Civil War battleground . The summer after our first year of graduate school, Neil and I journeyed up from Florida to Vermont so he could attend Bread Loaf Writers' Conference and I could help my mother move in Maine. Digging through old files last week, I found a random list of one-line typo-ridden notes. I dimly recall typing them one day while riding shotgun with my laptop as we headed north. 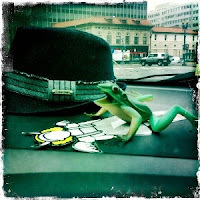 The goofy tidbits brought back travel memories -- Neil is great fun on the road, just remember to feed him every three hours -- and so I emailed the mess to Neil to begin refashioning: time for a poem. We trimmed words down and rearranged and added a smidge, and voila!, a conversational vignette on travel and friendship and how very weird the South can be (wigs!). Neil wanted to make a sonnet, but I apparently can't count syllables or delete (hey, my degree is in fiction for a reason), so perhaps we'll try that next, chug along with something else. My point is not to say, Woohoo! High Art right here! More that, unlike the Important Poems you may have had to memorize so you could recite them too quickly with no feeling and sweaty palms in 8th grade English class, formal is just one approach to wordsmithing. Another is collaborating with a friend to create an oddball trip souvenir.